WCLT - Nature Notes 7/15/2016 - What’s eating our trees? A gypsy moth caterpillar. Note the five raised blue spots in front and six raised red spots in back. What’s eating our trees? And leaving brown sludge on the ground or sidewalk under the trees? Most recently, the culprit is the gypsy moth (Lymantria dispar dispar) – its caterpillars, to be exact. The brown sludge on the ground is from the droppings (called “frass”) of gypsy moth caterpillars. Earlier in the spring, the culprit was the winter moth (Operophtera brumata), in the form of its small green caterpillars. What’s to be done? Well, maybe a rain dance. That’s not really a joke. The only thing that has come close to checking gypsy moth outbreaks is an insect-killing fungus (Entomorphaga maimaiga) from Japan, also known as EM or the gypsy fungus. But it doesn’t appear to be working. The problem? Not enough rain. The fungus spreads by spores that lie dormant in the soil and on tree bark, but as you might expect from a fungus, the spores need moisture and humidity – from rains in May and June – to germinate in the spring and infect young gypsy moth caterpillars. The caterpillars then die in about a week. This spring and last spring were dry in eastern and central Massachusetts, so this hasn’t been happening. A gypsy moth pupa. In this stage, the caterpillar transforms into a moth. Gypsy moths have been in Massachusetts since they were accidentally introduced from Europe in 1868-69 in Medford, MA. Only a decade later, in 1890, the first official efforts to eradicate or at least control them took place, but with little success. Many such efforts have been made since then. The Entomorphaga maimaiga fungus was introduced in this country in 1910-1911 and again in 1985-1986, but appeared not to work. 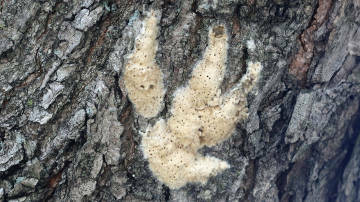 Then in 1989, the fungus was found to be infecting and killing gypsy moth populations. The fungus has been spreading in them ever since. The spores can last 11-12 years in the soil. Have you seen the gypsy moth caterpillars that are eating our trees? Near maturity – in late June and early July – they are hairy and about half an inch long. They have five pairs of raised blue spots near the front and six pairs of raised red spots in back (see photo). 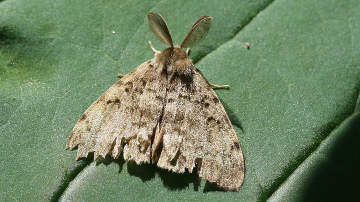 A brown male gypsy moth. Note the feathery antennae that it uses to detect chemical pheromones released by females. 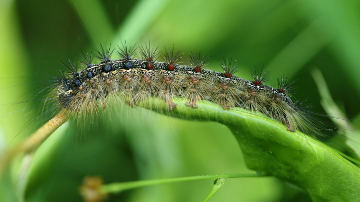 During outbreaks when populations are dense, the caterpillars eat day and night. They prefer oaks but, as we’ve been seeing, they will eat just about any greenery, including maples and conifers. 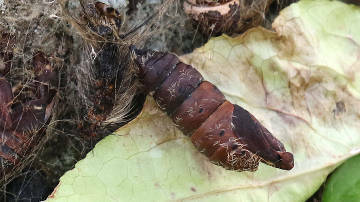 In early July, mature caterpillars become pupae (see photo). Outwardly this stage looks inactive, but inside the caterpillars transform into moths. The process takes about two weeks. The male and female moths look very different. You may already be seeing the brown male gypsy moths, which emerge first (see photo). These moths don’t eat. They fly around in a zig-zag flight, searching for females, even during the day. A white female gypsy moth on a tree trunk. It is laying a tan-colored mass of eggs. The white female gypsy moths emerge somewhat later, also in July (see photo). The females do not fly, although they do have wings. You might notice them on tree trunks, where they remain and release a chemical, known as a pheromone, to attract males. After mating, the females lay a tan-colored mass of eggs (see photos). The egg masses overwinter and hatch tiny caterpillars in the spring. If next spring is a wet one, the new generation of caterpillars will be infected with the fungus and die before greatly damaging our trees again. A gypsy moth egg mass on a tree trunk. The eggs overwinter and hatch tiny caterpillars in the spring. The pinholes in this egg mass show that a tiny wasp laid its own eggs in this eggs mass, so the wasp larvae could eat the gypsy moth eggs. Besides the fungus, the gypsy moth has other enemies that can help to control it. They include: a virus known as NPV (short for nucleopolyhedrosis virus) that infects and kills gypsy moth caterpillars; a tiny wasp (Oencyrtus kuvanae) from Japan that lays its eggs on gypsy moth egg masses, which the wasp larvae then eat (see photo); our native white-footed mouse (Peromyscus leucopus), which eats gypsy moth pupae that it finds on the ground; and our native chickadees and nuthatches, which eat gypsy moth eggs in winter. What about the trees that were defoliated this year? Most will put out another set of leaves this summer, as you may be seeing, when the time for gypsy moth caterpillars to eat is largely past. If trees are defoliated for two or three years in a row, or if they are weakened for other reasons, such as drought or disease, they may die, generally in two or three years. For now, let’s hope that conditions in our area next spring will be right for the fungus to infect next year’s gypsy moth caterpillars and cause the local population to collapse. 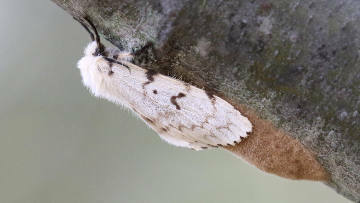 If you’d like to find out about measures that might be taken month by month to protect specific trees on your property, check out the University of Wisconsin-extension gypsy moth web site.